If you are looking for electrical repairs for your home or business, Kronos Electrical can help. Our electricians offer same-day service to your home or business, and can repair any job no matter the size. Our 24 hour emergency service makes sure that if you need electrical repair outside of our standard business hours, somebody will be there to help. When you contact Kronos Electrical for your electrical repair needs, we will send a highly qualified electrician out to your home and business on the same day. We pride ourselves on offering the best when it comes to electrical services and have built our business on these high standards. Whether your electrical repair job is big or small, our electricians can assist you. 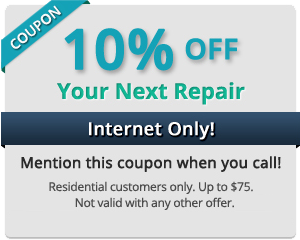 If you don’t see a repair listed above, contact us today, we can discuss your electrical repair needs and offer you a solution. Unlike other electrical companies, Kronos Electrical simply charges a flat fee. You pay for the job rather than the hours of labor, this gives you a reliable price to go off before we even start the job. There are no hidden fees and no surprises. Our flat rate pricing is highly competitive and allows you to trust us from the beginning. Why Hire Kronos for all of Your Electrical Repairs? Kronos Electrical has built a reputation over the past 10 years for our high quality workmanship and reliability. Our electricians go into every job looking to gain a lifelong customer. We back up our quality workmanship with a 10 year warranty. This warranty is good on the products we install and the workmanship, you can trust us knowing that if something goes wrong, we will fix the problem, and you will get your money back. Hundreds of home and business owners trust Kronos Electrical to get the job right the first time. If you are in need of electrical services, contact the experts at Kronos Electrical today for a free, no-obligation electrical repair estimate today. Call us at 416.579.1707 or fill out a contact form to get started!